Susie Jenkins-Brito, a fisherman in Dillingham, stands for a portrait. Jenkins-Brito views salmon as “essential to our way of life here in Bristol Bay.” Pebble Mine, a proposed operation in the headwaters of Bristol Bay, poses a potential threat to fish living downstream. Commercial salmon fishing has employed about 5,000 people in Alaska in recent years. The fight over the measure exemplifies a state wrestling with its own identity: a place defined by both a history of resource extraction and some of the last robust salmon runs in the nation. In the midst of a federal push to reduce environmental regulations, the ballot measure’s success or failure could determine the future of Alaska’s world-class natural resources — and indicate how the state’s citizens will balance the often competing needs of two of its iconic industries. But for several months, it was unclear if the measure would even make it onto the ballot. In a lawsuit last year, the state argued that the initiative unconstitutionally limited the ability of Alaska’s top wildlife official to make permitting decisions, effectively prioritizing salmon over development. In early August, the Alaska Supreme Court ruled that the measure would appear on the ballot, though in an altered form: The court removed provisions that would have forced the commissioner of the Department of Fish and Game to deny certain permits, thereby allowing the commissioner leeway on permitting decisions. “You talk to people in Alaska, and we are connected to salmon in one way or another,” says Quinn-Davidson, who is also the director of the Yukon River Inter-Tribal Fish Commission, a consortium of about 30 tribes along the river focused on salmon conservation and traditional fishing rights. Every summer, for example, Quinn-Davidson and her partner try to catch enough fish to feed themselves throughout the year. Especially in rural villages, where more than a third of the state’s population lives, salmon are at the heart of a complex network of cultural, nutritional and economic ties. Commercial salmon fishing has employed about 5,000 people in Alaska in recent years, and in 2013, 1 billion pounds of salmon, worth nearly $680 million, were caught, contributing to a $3.27 billion seafood export industry. But in a state with limited economic opportunities, another natural resource is also critically important: minerals. Alaska’s mining industry accounted for about 4,000 jobs and exported gold and other metals worth $2 billion in 2013. The November vote on Measure 1 will force Alaskans to consider the balance between the demands of the two industries. 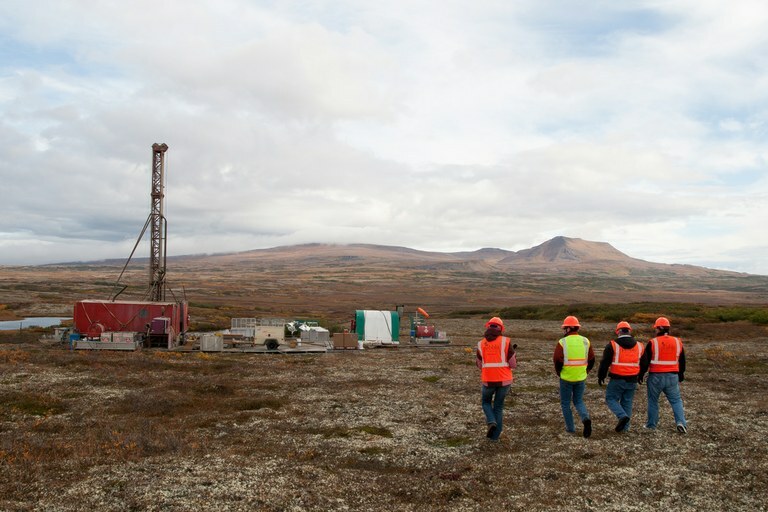 During a tour of Pebble Mine, members of the media approach an exploratory drill rig. Alaska’s mining industry accounted for about 4,000 jobs in 2013. MOST PLACES IN THE U.S. that once had thriving salmon populations have lost them to development, climate change and other factors, but Alaska’s salmon remain, for the most part, still abundant, says Pacific salmon expert Ray Hilborn, a professor at the University of Washington’s School of Aquatic and Fishery Sciences. Protecting salmon habitat is one way the state could help them continue to thrive. “Making sure that you don’t push salmon off the list of concerns when you’re permitting development is, I’d say, a pretty high priority,” he says. While Alaska’s current regulations do require consideration of salmon, they don’t include much detail on how to do that. The state Fish and Game commissioner can deny a permit for development in a salmon stream if the project plans “are insufficient for the proper protection of fish and game,” but the statute doesn’t define what that means. The ballot measure would clarify the law by listing the factors that should be maintained to protect salmon habitat, including water quality and temperature, seasonal flooding and riverbank stability. The measure also creates different permitting paths for differently sized projects. Its tiered permit system means that mining more than a billion tons of ore would require more scrutiny than, say, small scale suction dredging. The Department of Fish and Game could issue minor permits for small projects; general permits for activities within a specific geographic area with only negligible impacts, like hunting or berry-picking; and major permits for Pebble Mine-scale projects. All permits would require public notice, and general and major ones would also require a 30-day public comment period. Only permits for large-scale projects would need a public assessment that includes development plans, potential harm to habitat used by salmon or other fish that migrate between fresh water and the ocean, and ways to “avoid or minimize” that damage. But opponents of the measure, including Alaska Native Corporations, industry groups and mining companies, say it’s overreaching and overly complicated. “They’ve created this huge rat’s nest of a process that’s so unclear, so subject to interpretation, so fraught with legal challenges that it’s going to be difficult for big and small development to take place,” says Kurt Parkan, the external affairs manager for Donlin Gold, the company behind a proposed mine in southwest Alaska. It’s not clear how the ballot measure would affect major projects already close to construction. Donlin Gold has proposed an open-pit mine, where a tailings facility would eliminate a small salmon stream. Though the company has yet to receive fish habitat permits for a 315-mile-long natural gas pipeline needed to power the facility, the Department of Fish and Game approved several of Donlin’s other fish habitat permits on Aug. 30, and the initiative explicitly exempts existing projects. Pebble Mine, a proposed operation in the headwaters of Bristol Bay, might face tighter restrictions: It has received exploratory permits from the department, but none for mine construction. By mid-September, hundreds of individuals, companies and organizations had donated to support or oppose Alaska’s Ballot Measure 1. Here are the largest contributors, according to public campaign records. Contributions include both funds and non-monetary support, things like staff time and event coordination. Stand for Alaska and Yes for Salmon are both political groups dedicated solely to this campaign; Stand for Salmon is a conservation group. 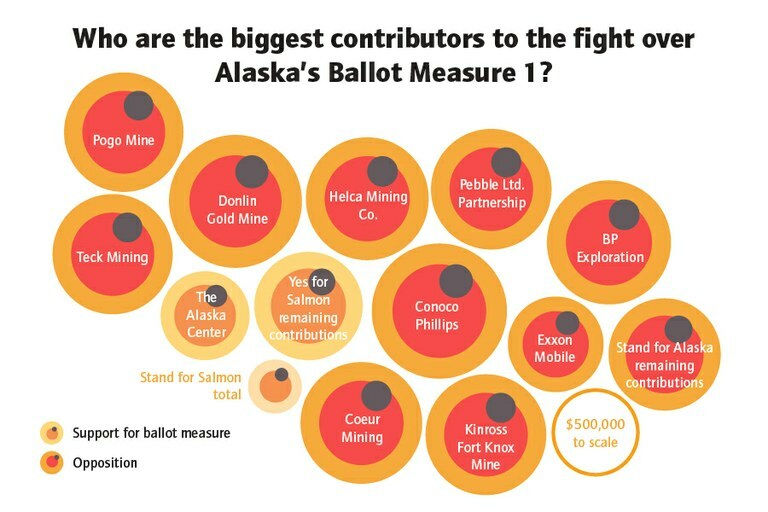 Before Donlin Gold secured its permits, it was already one of the biggest donors to Stand for Alaska, the group fighting the ballot measure. Donlin, which is co-owned by Canadian companies Barrick Gold and NOVAGOLD, gave $1.2 million to oppose it as of early September — about $300,000 less than the entire amount raised by the initiative’s supporters by mid-September. Altogether, Stand for Alaska has raised more than $11 million in donations. Some of that support came from other groups that also rely on development. Mining profits, for example, are one reason why Doyon Limited, the Native corporation of Interior Alaska, is urging Alaskans to vote against the initiative in November. (The corporation donated nearly $20,000 in staff time by late July, and another nearly $20,000 in uncategorized support by early September.) Another is the possibility that roads, wastewater treatment plants and other infrastructure projects could become prohibitively expensive if the measure passes. Because of those concerns, “we must stand together and reject this ballot measure that purports to be designed to protect salmon, but that will likely set our communities and Alaska Native people back by decades,” wrote Kim Reitmeier, the executive director of the Association of Alaska Native Regional Corporation CEOs, in a July opinion piece. Meanwhile, federal measures that would protect fish habitat are imperiled by an administration focused on prioritizing development and easing environmental regulations. Since 2017, Trump administration officials have suspended an Obama-era rule expanding clean water protections, reversed a moratorium on offshore fossil fuel development in parts of the Arctic Ocean, and taken action to resurrect Pebble Mine. And in mid-August, Donlin Gold secured the federal approvals needed to build its mine, issued separately from state permits. “There’s definitely a greater sense of urgency, given what we’re seeing at the federal level,” Quinn-Davidson says. Ryan Schryver, the director of Stand for Salmon, sees the ballot measure as a way to support an economy that includes both healthy salmon fisheries and responsible resource development. “I do think that we are very much in a battle for the heart and soul of Alaska,” he says.